Figure 5 depicts the logical hierarchy of the DACS. Integration of custom and off-the-shelf hardware is accomplished through the means of custom software components. 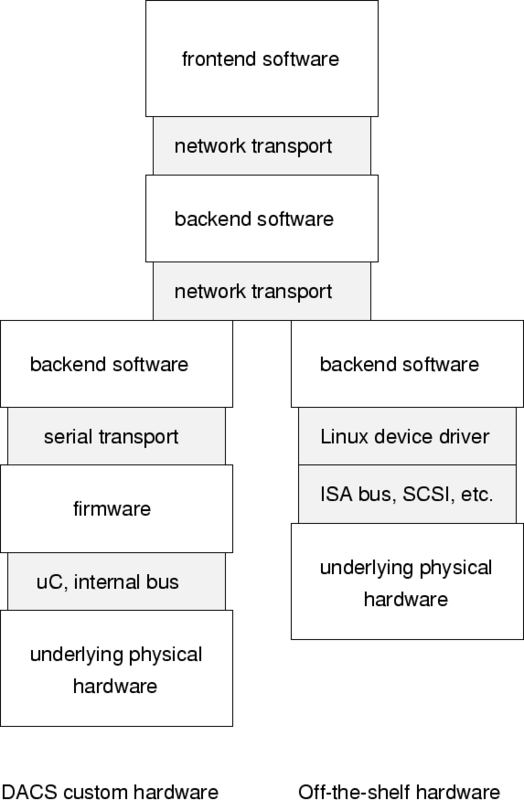 Network transport layers promote the concept of distributed task servicing. DACS service providers appear as services on hosts located on a network, or on a single host (using the internal loopback as a virtual network device). Front-end software accesses individual devices through a series of abstraction layers, such that the actual location and physical characteristics of the underlying hardware providing the service need not be known by that software. Figure 5: DACS component hierarchy, generalized view. This abstraction paradigm allows generic descriptions of actions to be created which do not depend on the underlying hardware. This would allow, for example, the cues for a touring theatre show to be defined generically, and run on almost any DACS configuration. One can even imagine a CD-ROM with a generic DACS audio script (with all supporting sound effects, etc.) being sold with the script for the play itself.